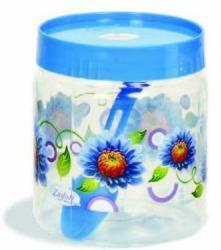 Our product range includes a wide range of plastic printed pet jar and plastic plain pet jar. With the underwriting of our capable experts, we are occupied with offering a subjective scope of Plastic Printed Pet Jar. This compartment is produced by our talented workforce in our assembling unit utilizing high caliber of material. Our holder is checked by our quality controllers on distinctive parameters to supply an imperfection free roaming. We give this holder to our clients in different sizes & hues. Looking for Plastic PET Jar ?